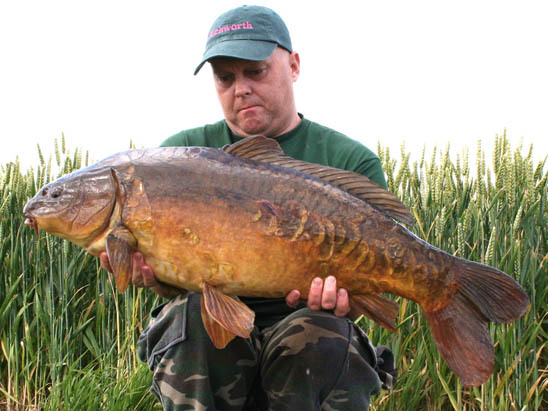 Mid June saw myself along with young Richworth consultant Harry Charrington meeting up on the banks of linear fisheries. We were there to do our bit in the upcoming video section on the website and Media manager Pete Wilson was on hand to catch Harry and I in action. I arrived late on the Sunday night just before the gates locked and met Pete and Harry on the banks of Manor Farm. The fishing was slow to say the least as spawning was clearly on the minds of the fish but the cool weather seemed to be holding them back a little. It was clear that the lack of action for all the anglers meant Harry and I would have to work are socks off to catch anything! After a quick chat and a slow walk round I was simply not feeling the vibes I was getting at all on Manor and with little to go on and no real swims left that put me in the area where at least some fish were showing I strolled over to St Johns to see what I could see. The feeling was pretty much the same to all the angler I spoke to, one chap had been there for 12 days and not had a bite in the last week! Oh well, at least I could get fishing even though it was now well after 10 pm. Walking round the shallows I stopped and sat on the hill looking up at the lake in the failing light, suddenly Bosh! One cleared the water close in to my right. Two minutes later another, then another! In ten minutes I’d seen a dozen fish and as quick as I could legged it back to the car for my gear. By the time I’d got round and sorted it was after midnight, a couple of rods fished close in with small solid Gardner PVA bags… …seemed the best option, I chose to use maize hookbaits that had been soaked in Richworth’s Minamino as I knew when the conditions were tough these could bring bites when all else failed. 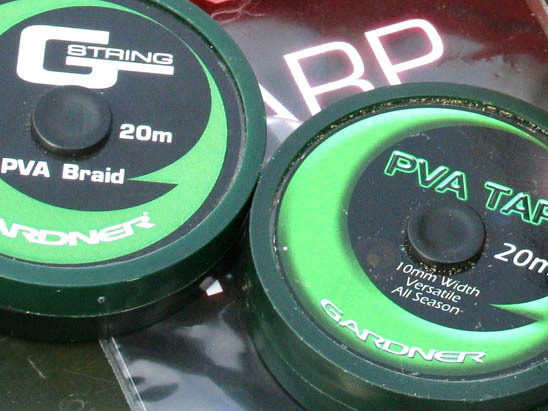 With some K.G.1 Bag and Stick mix and some PVA friendly hemp in the bags the menu was set; it was now up to the fish. The first bite came at 1.30 am just as I’d snuggled into the sleeping bag and resulted in a pretty low double fully scaled mirror; I re-bagged and flicked it back to the spot. An hour later and the rods away again as another double, this time a near leather carp fell to the heavily soaked maize hookbait. By the time I’d got the rod back out and had a cuppa it was 3.30am and as the light was breaking I found it hard to sleep opting instead to watch the water for the next couple of hours. By 9 am I was shattered but with fish starting to show on the surface I got the rods re-done with zig rigs. 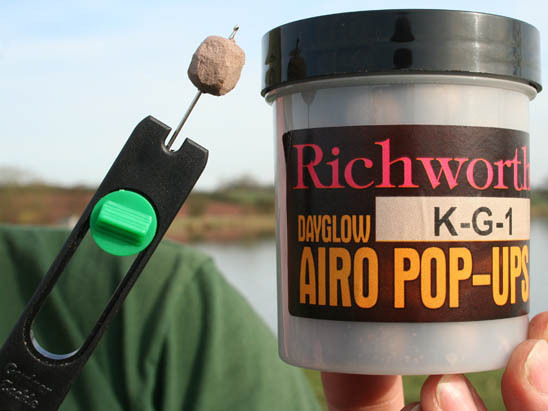 A trimmed down K.G.1 pop up was used on one rod and a small piece of Gardner black foam on the other. After changing depths a couple of times I finally got a take, the rod ripping off as something had picked up the little barrel pop-up. A brief tussle in the shallows and soon a pretty mirror of around 18lb was safe in the net , Pete was on hand with the video camera and after slipping her back I wrapped up and made my way over to Manor to do some filming and catch up with what had been happening. It appeared only Harry had caught on the whole lake, another small one of 19lb, again on a zig. At least we had a fish a piece for the video, we spent the rest of the day filming and later that evening I dropped into Harry’s vacated swim and whacked a couple of zigs out to the middle. It was only and hour or so later and in the middle of a rain storm when my right hand rod whizzed off, hooked at over 100 yards the fish made the most of the weed in front of me. I could tell a big fish was on the end of the line, the deep heavy thud continually being felt up the rod as she powered off again and again. Despite this I managed to get her back within 30 yards or so of the bank and was just starting to think at last a chunk was on the cards for the video when the hook fell out! Talk about gutted, I spent the rest of the night sulking in the rain and trying to catch up on some much needed sleep. The next morning after another bit of filming I started to wrap up when the same rod signalled another fast take. 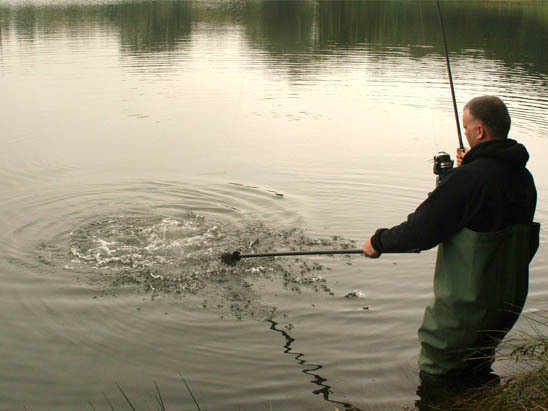 I bent into it and started to pump it holding the rod high in an attempt to clear it of the weed when the line suddenly fell slack; I reeled in to find the small size 10 hook slightly opened out and the fish long gone. That was that I’d had enough, I said my goodbyes to Roy and headed north and back on the syndicate for the rest of the day. I arrived to find the lake deserted always a good sign on this small quiet little water, the fish in here seem to be aware very quickly as to the presents of anglers and are soon on edge. I dropped my gear into the north east corner which was at the end of a lovely warm wind. Once the rods were in position I sat back and soaked up the warm rays of the sun. It had been a hectic 48 hours with little sleep but I was still eager to scan the water and keep watching for signs of fish. The next few hours I managed a couple of bites, a lovely 21lb mirror and a golden 19lb common both falling to the ever reliable K.G.1 wafter hookbaits fished over chopped freebies. The heavy flat pear leads and short hooklinks were tripping them up and the Mugga hooks were firmly placed right in the bottom lips. On the drive home reflected on the last couple of days fishing I’d had 7 chances in less than 40 hours actual fishing time so thing were not to bad. The run of small fish and the thought of one of those lost Manor lumps played heavy on my mind for the next couple of days. I would just have to keep at it, keep applying the bait, keep getting bites and prey one of the big un’s on the syndicate would finally trip up.